This documentary has too many humans and not enough penguins. Then it’s off for adventure. Unfortunately, more than half the documentary is about getting to the penguins. The penguin counting team travels south on a cruise ship that stops at Deception Island, where the depredations of the whaling industry are discussed, and at South Georgia Island, where there is a diverting discussion of Ernest Shackleton and the cracking apart of his ship, the Endurance, in 1915. When the team transfers from its cruise ship to its smaller craft, that is documented as well, along with regular dinners that always include large helpings of mashed potatoes. The movie includes shots of several types of penguins but focuses on the counting of chinstraps, the largest group in the penguin universe. This is accomplished by visiting known chinstrap hangouts during the season when penguins are homebound, sitting on their nested eggs and awaiting the emergence of hatchlings. My guess is that the traveling film crew was limited by bad weather, and perhaps also by limited funds, and so was unable to get as much film of penguins as had been planned. Why else would this documentary be only 70 minutes long when most feature films run between 90 minutes and two hours? How else to explain the inclusion of footage of a penguin counter getting a haircut on the boat deck? Two matters not addressed in “The Penguin Counters” occurred to me as I walked out of the theater. 1. Why count penguins using clickers? I get that Naveen and his people love-love-love penguins. Who doesn’t? (To my knowledge, there has never been a movie documenting fluctuations in, say, the mole rat population and the implications for climate change.) Personally, I’d love to visit penguins in situ, but I’m not sure that it’s a good idea for humans to go tromping through previously unsundered landscapes and distracting the animals. I wonder whether this research could be undertaken more efficiently — with maps broken into quadrants of known penguin nesting sites and detailed satellite studies and high-res aerial photography during the occasional fair-weather days of appropriate seasons. Clickers are so 20th century, after all. 2. There isn’t much discussion of how climate change could affect penguin numbers except an assertion that climate change may have reduced the krill population in southern seas. Krill are small shrimp that make up a large part of the penguin diet. Krill also make up a large part of the whale diet, according to the movie, which notes that the blue whale was nearly harvested to extinction. The implication is that whale blubber, used to make oil in the pre-Spindletop days, was the reason for the excess whaling. Whaling actually became much more mechanized and efficient in the 20th century, when many more whales were killed, particularly in the Southern Hemisphere. This is illustrated in the chart below, which comes from nature.com. Think about it: Whales are big eaters. 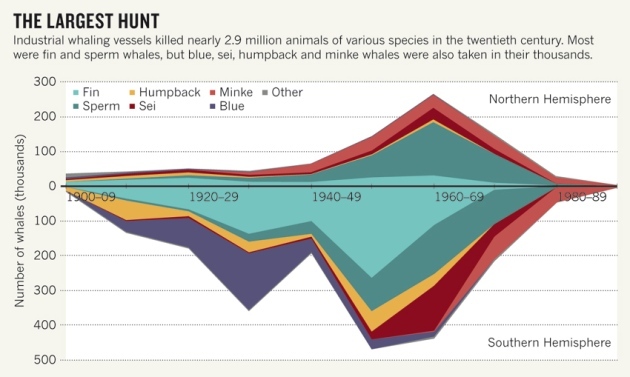 If krill are a major food source for whales and the whale population declined precipitously up to and through the 1960s, as seems to be the case, wouldn’t more krill have become available to foster an increasing penguin population toward the end of the 20th century? Could that have been the period of Peak Penguins? Could the declining penguin numbers since reflect that more penguins a generation ago led to the overconsumption and reduction of the krill population and that a right-sizing of the penguin population is under way? In fact, penguin counting started about 30 years ago. There are serious scientists who research human effects on animal populations, but data may be too scarce for longitudinal study in this case. One more thing: A 2016 article republished in Scientific American says penguin populations have been declining for 30 years (again without reference to previous populations) and speculates that warmer temperatures have led to declining sea ice, making life more difficult for krill and penguins. It includes a quote from the spokesman for a Norwegian krill-fishing company who disputes that krill fishing has had any effect at all on any of this. Who knows? Perhaps the penguin-counter filmmakers decided to avoid the whole matter as too complicated and science-y for a general movie audience. Still, I’m curious. The long camera shots of penguins and the land masses of the Southern Hemisphere were the high points of “The Penguin Counters” for me. In fact, there are two earlier documentaries about the area that I thought were even better. “March of the Penguins,” documents the annual movements of emperor penguins without getting involved in the stories of the humans who love them. It was released in 2005 and is narrated, excellently, by Morgan Freeman. “The Endurance: Shackleton’s Legendary Antarctic Expedition,” released in 2000, is a great adventure story about the British ship that broke apart in the region and its crew, led by Sir Ernest Shackleton, who managed to survive more than a year of desolate hardship before making their way home.